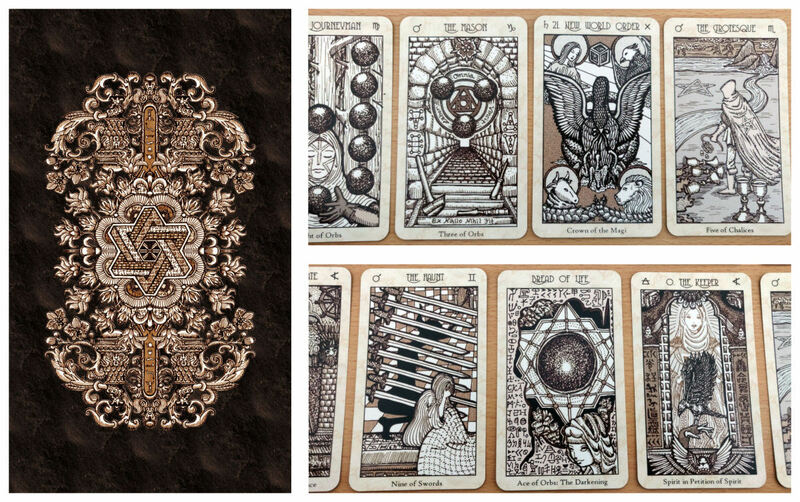 Spirit Keeper’s Tarot is a hand-illustrated 78-card tarot deck (with 2 additional versions of Key 0, for a total of 80 cards) inspired by late Renaissance woodcut prints, with symbology based predominantly on medieval European alchemy, Hermeticism, Zoroastrianism, astrology, the Kabbalah, Abrahamic angelology, Egyptian mythology, Sufism, and late Renaissance Christian mysticism. The narrowly-tailored premise of Spirit Keeper’s Tarot is to transform tarot keys into calling cards for accessing a spirit world of beneficent immortals. The artwork is original black and white line drawings done by hand, by me, in pen and ink, then digitally remastered to monochromatic sepia tones. The cards are bordered with a tea-stained parchment design. All decks will be anointed with hand-crafted holy anointing oil made of Ceylon cinnamon, cassia cinnamon, myrrh resin, and sweet lemongrass. While the First Edition SKT deck was in black and white, a largely faithful scan of the original line drawings I did by hand, the remastered Vitruvian Edition is in monochromatic sepia tones with redesigned architecture. The namesake for this edition comes from Vitruvius, who lived around 80 B.C. to 15 B.C. Vitruvius was a Roman architect who taught that every structure must exhibit three qualities: stability, utility, and beauty. These three qualities have come to be known as the Vitruvian Triad. A millennium after Vitruvius, Leonardo da Vinci was inspired by the Roman architect’s works. One of da Vinci’s most famous sketches–rendered in sepia ink–is the Vitruvian Man (1487). We will place our print run order based on the number of pre-orders we get plus a couple hundred extra to spare. That’s it. After this print run is sold out, we won’t be reprinting. Even if a future SKT deck happens, it won’t be for many years and it will be different from this version. SKT will not be handed over to a mass market publisher anytime soon, either. I craft my own anointing oil from essences and macerated oils I make myself from raw ingredients painstakingly sourced to ensure quality. The Ceylon cinnamon bark was purchased at the Grand Bazaar in Istanbul, Turkey. The cassia cinnamon leaf was imported from India. I use whole, highest grade myrrh resin (tears of myrrh) and lots of it (because making your own true essential oils requires a lot of myrrh). The lemongrass is fresh, local produce that is personally sun-dried over several months before the oil-making process even begins. And then the oil making process takes another several months before they’re ready. The olive oil is from Athens, Greece. Multiple layering of astrologically-timed ritual work is crafted into the anointing oil. Orders of up to 3 (three) decks will cost a flat rate of $8. For orders of 3 (three) decks or more, please contact James at abelldelivers@gmail.com before purchasing for a price quote of shipping costs. 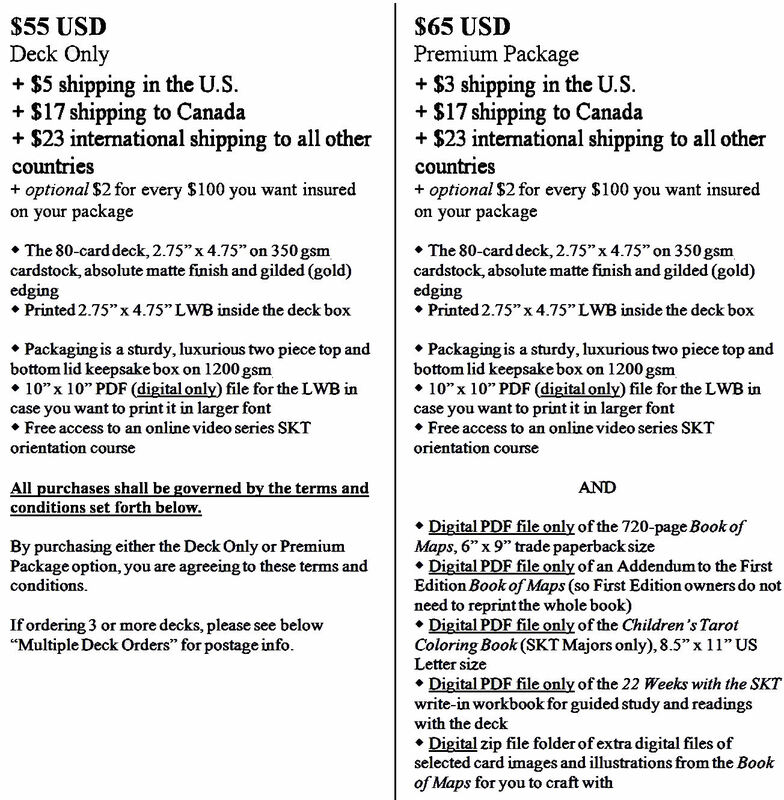 2 (two) or less decks will be covered by the shipping cost noted above. In one single payment, remit the total dollar amount for number of decks ordered, packages ordered, shipping cost, and any optional insurance. By placing an order, you are consenting to the terms and conditions set forth below. VERY IMPORTANT! We will e-mail you a confirmation notice within 7 (seven) business days of our receipt of your payment transfer. If you do not receive a confirmation notice in 7 (seven) days, something went wrong. Please e-mail us at abelldelivers@gmail.com immediately. Sometimes it’s because the wrong e-mail address was entered in for payment. Other times something just got lost in cyberspace. To make sure your order is accounted for, you need to have a copy of the confirmation notice. This is our checks system. All confirmed orders will get an e-mail confirmation. We are not responsible for lost or damaged shipments, which is why we recommend purchasing the optional insurance. Optional insurance costs an extra $2 for every $100 you want ensured. Packages lost or damaged in transit are covered under the U.S. Postal Service insurance policy you purchase, and if no insurance is purchased, then there will be no refunds or replacements for loss or damage. Please read the terms and conditions below carefully. With the First Edition, over 95% of purchasers ordered the Premium Package that included the online video course series. That’s why I decided to make the online video course series public and freely accessible. I figured this would be most convenient for all and would spread around the good karma. In addition to that video series already freely available, I will be producing another set of videos to go along with this redesigned deck, with new content tailored around the aspiration to make this deck more intuitively accessible so that you don’t feel like you need to be anybody other than yourself or to know anymore than what you already know (or are willing to learn) to gain access to all that this deck can offer. The set of videos that went with the First Edition deep-dived unapologetically into mystical realms that required the suspension of rational skepticism, i.e., we were talking about your Holy Guardian Angel, ritual magic, angels, demons, the Akashic Records, and that kind of thing. The new set of videos will be more practical and applicable to everyday readings. How do you interpret SKT court cards in readings? How do you actually and effectively integrate basic beginner-level astrology with tarot readings, using the astrological correspondence system that the SKT deck follows? How do you use your deck and Book of Maps together to do an I Ching and tarot divination? Only the $65 Premium Package will come with the Book of Maps companion guidebook to the deck and it’s just a PDF digital file. Everything in the Book of Maps, First Edition will still be in the revised Book of Maps, with updated card images, card entries, and some minor line-editing. You can read sample chapters from the Book of Maps here (scroll down to the bottom of that page for the hyperlinked sample chapters). There’s also an additional 230+ pages to this revised edition of the Book of Maps. The new additions will include more on how to read the SKT court cards, working with the Olympic spirits, integrating astrology with the tarot, integrating gematria with the tarot, and an entire reference section on using the tarot and I Ching divination together. You will be able to look up short form I Ching oracles based on your SKT tarot card readings by consulting this Book of Maps. No additional I Ching texts required. Brace yourself. There are a lot of them. Because experience. We are not liable for packages that the postal service has recorded as “Delivered.” If you see that the tracking information for your package notes “Delivered” but you have not received it, then you will need to contact your post office for more information. You have to e-mail your claim to abelldelivers@gmail.com. Please do not send me a private tweet, direct message on Instagram or Facebook, leave a comment on an arbitrary blog post or Instagram photo from like five months ago, or try to communicate with me telepathically about your claim. Please stick to e-mail. We will only be answering claims that have been e-mailed to abelldelivers@gmail.com. Please e-mail us photographs of both the front and back of the damaged card and make sure the photographs are reasonably clear before you send. Please do not send us blurry photos and expect us to know what we’re looking at. Please send the photos as image file attachments. Damages to the cards that would reasonably impact a tarot reading will certainly be replaced, such as a noticeable manufacturing defect on one of the card backs, printing smudges or printing errors on any of the cards, or altogether missing cards. Manufacturing defects to the cards will be replaced. Minor issues that are reasonably foreseeable and commonplace risks when buying tarot decks will not be replaced. Significant or total damage to the deck box will be replaced. However, minor or subtle dings, scuff marks, or scratches to the box will not be replaced. You understand that there are no guarantees of perfect, flawless application of gilded or gold edging on your deck. Gilded edging on decks is produced through a process that crushes gold-toned plates into fine grain and then that fine grain, a gold dust, is applied to the cardstock edges under high pressure and heat until it is sealed onto the stock. Some fall-out is inevitable. We cannot guarantee that there won’t be some fall-out with your gilded edges. Furthermore, note that harsh shuffling and handling of the cards might wear down the gilding. Your order may be subject to VAT taxes that you have to pay your government. Your order may be subject to import fees that you have to pay your government. Your order may require you to take a trip to the post office and be physically present to pick up the international shipment, which may also require that you show a photo ID, so the name on your photo ID would need to match the name of addressee on the package. In other words, if you tell us to print your name as “Shambala Thunder Fairy” but your government-issued ID says “Bob Smith,” you may run into problems at your post office. For international shipments, our customs declaration will state that the package is for “tarot cards.” Before you place your order, you are responsible for verifying that declarations for “tarot cards” can be imported into your country. Please note that some countries in the Caribbean and in Muslim countries ban the import of “occult objects” and as we’ve come to learn, that includes a tarot deck. You are responsible for confirming that tarot cards can be shipped to your country before placing your pre-order. Get on the mailing list to receive important updates and progress reports about your pre-ordered deck. I will be sending progress reports, important updates, and everything related to your order of the SKT deck by the mailing list linked here: www.tinyurl.com/SKTnews. From now until the pre-order window closes, I’ll also be sending exclusive previews, maybe some freebies, and who knows what else through that mailing list only. Whether you’re just interested in staying up to date on the progress of the Vitruvian Edition or you’ve already pre-ordered your deck, get on this mailing list! This isn’t some promo marketing thing. It’s 100% a my convenience thing. I can easily, by one click, send out notices to everybody who has consented to receiving e-mail notices and don’t have to keep track of or keep on updating any manually created email lists. This edition is going to be the last SKT print run for a very long time… years, or maybe even never. We are going to place a production order based on the pre-order quantity, plus some hundreds to spare and sell until they run out. And then that’s it. We are not going to reprint this version of the deck. We might consider reprinting new versions of SKT way, way down the line in the future, for a possible five-year anniversary or ten-year anniversary special. In fact, there’s even the chance of never. SKT will not be handed over to a mass market publisher. Maybe when J and I are so old and feeble we can barely hold a pen to write our own names, we might at that point give SKT to a publishing house, but it won’t happen anytime soon, so please don’t hold out for what you hope will be a cheaper version of the deck in two years. Please e-mail your inquiries to abelldelivers@gmail.com.